The Town Hall is located on State Hwy. 113 in the old Chapel Hill School (1927). 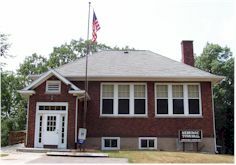 The school was restored by the town in 1997 and serves as a true historical landmark. The town hall is generally open Monday - Friday but hours vary from day to day. Fixed office hours are usually on Monday's, but there are exceptions. Call before you stop in if your time is not listed below!